You've come to the right place if you're looking for help with the Lab! To get started with designing your custom item, select a product from the grey drop-down area. Clicking on an item will open a preview in the design window, as well as a detailed description of the product's features. Alternatively, you can click the drop-down menu to the left of the product thumbnails to filter your results by category or garment type (eg. "Mens T-shirts", "Caps", etc.). To add in your witty slogan or custom text to your design, click the "Add Text" tab. In the small text field, type the text you'd like to place. If you have two pieces of text you'd like to move and style independently, click "Create Text" when you have finished typing the first, then you may begin typing your next. Once you have created your text, you can start adding styles to it including different fonts, colours and effects by clicking through the drop-down menus to the right of the text field. Using these tools effectively and creatively can help you achieve some awesome eye-catching text effects and designs. Let your imagination run free! Included in the Lab, is a library collection of custom logos and stock artwork to help you build the masterpiece you invision. These include famous symbols such as the iconic "Che Guevara" T-shirt, to shapes, silhouettes and parodies of famous logos. To view this library, click the "Use Clipart" tab. As with the "Choose Products" tab, you can browse in two ways: by clicking the arrow to the bottom right of the artwork thumbnails or by filtering through specific artwork categories. If you're a step ahead and already have your T-shirt design drawn up -- the "Upload Your Artwork" tab is what you're looking for. 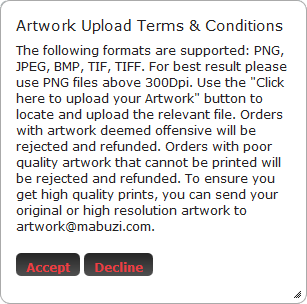 Click it, hit "Upload", read through our terms & conditions, and click "Accept". The Lab should then open up a file browser of your computer. Click "Select File", navigate to the location of the file on your computer and then click "Start Upload". Once your file has finished uploading, you should see a preview window. If you'd like to remove a colour from your image click on the colour in your image and adjust the "Sensitivity" slider until you get the result you're after (lab tip: this feature is commonly used to remove the white backgrounds generated by many image editors when saving image files). Once you're happy with your image, click "Add to Design". This will add your design to both the design window so you can edit it, and your temporary custom artwork library (displayed immediately above the design window when the "Upload Your Artwork" tab is selected). This library temporarily stores each file you upload so that you can access it at any point in the design process. 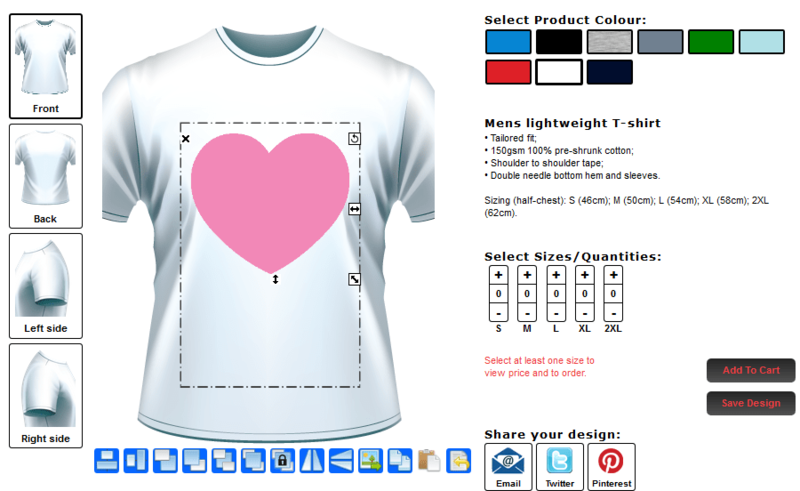 There are a number of ways to edit and manipulate the elements you place on your T-shirt. Some of these include rotation, scale, position, alignment and layer. When an object is selected or "highlighted" (this is done by clicking on the object in the design window) a number of tools appear around it. The cross to the top left of the design element removes the element when clicked; the round arrow to the top right of the element allows you to rotate the element when clicked and dragged; the diagonal arrow to the bottom right allows you to resize the element while keeping the width and height proportional; the two arrows on the right and bottom allow you to manipulate the width and height independently. To position your element, click on it and drag it to where you'd like it to be. In addition to these basic design tools, the buttons along the bottom of the design screen allow you to edit the "layering" of objects, or the order in which they appear (the top-most layer covering the layers under it, and so on). Once you are happy with the masterpiece you have just created, you can begin placing your order by selecting the sizes and quantities in the lower right area of the design window, and clicking "Add To Cart". • The dashed line rectangle in the design window indicates printable area. Any artwork that falls outside this area will not be printed. If you have special printing requirements, please contact our staff. • Prices are best calculated in the Lab when a product is selected, artwork applied and the quantity adjusted according to your requirements, this will provide the most accurate estimate of printing in the Lab. As the number of logos, size and print positions are incremented, the Lab will calculate the cost of the printed product. • Decoration colour swatches (for text and stock artwork) are not always indicative of the actual colour. Please make sure to read the colour descriptions when you hover over them to ensure you are selecting what you want. This is the most common misunderstanding that occurs when customers use our Design Lab and is important to be aware of. Once again, if you are not sure that you've chosen the correct colour, please contact us as soon as you can before your order is processed.